15 Places to Visit Before You Die! As a photographer and director, I have been to my share of places in the world! Checkout my list of top places to go in the world. Each and every place is literally to die for! Over 3.5 million Swarovski Crystals decorate this gorgeous spa retreat. The 40,000 sq foot Kurspa is inspired by the health and wellness retreats of Europe and pretty much the only place like this in all of North America. If you like Swarovski crystal chandeliers and spa treatments, this is definitely the place to go! Located on top of the hill at the famous golf resort known as the Tryall Club in Montego Bay, Jamaica, the Hummingbird House was recently renovated in 2013. 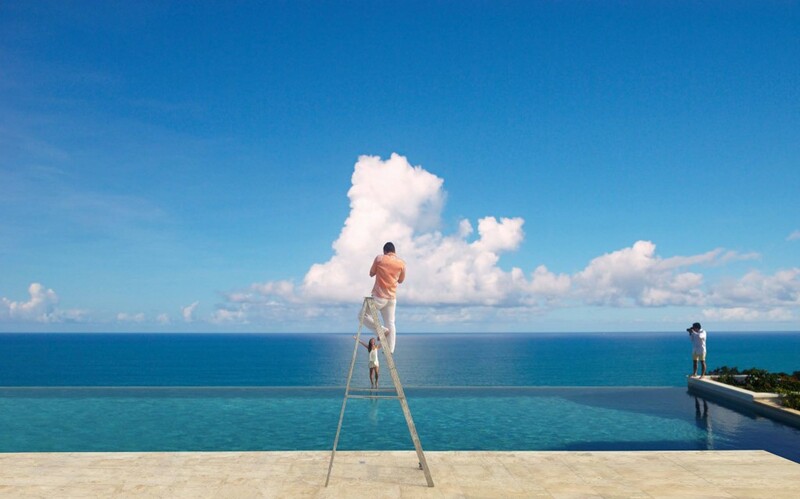 With 7 bedrooms, an infinity pool and view to die for, it is one of the most relaxing places in the world! 6 of the 7 bedrooms have views of the Caribbean Sea and the property has 4 outdoor showers. Not to mention, the villa comes with your own butler, private chef and maids. Afternoon tea is including in your stay at the Tryall Club Greathouse everyday! Villa Crew is 2 private villas located on the magical island of Mykonos Greece. With sugar cube architecture and contemporary white interiors, Villa Orpheus boasts one of the best sunsets on the entire island while Villa Eurydice has views of Ancient Delos and Mykonos town. We loved the selection of specialty cocktails and cuisine…but best of all is when you get to meet Villa Crew owner Katie Friedman. She always knows how to throw a good party! The Royal Suite is literally fit for a King! Once it was the master bedroom for the Duke when it was his home but now you can stay in it for a cool 3000-6000 Euros a night depending on the season. Sit on your grand maharaja bed and gaze at your gold plated ceiling with a giant chandelier that hangs in your private palatial enclave. The May Fair Hotel has been a staple of the London Hotel scene for years and it’s not surprising to see Keith Richards, Steven Tyler or Jon Bon Jovi having a cocktail in the lobby. During fashion week, the May Fair is infested with models and celebrities…not a bad place to be. We love London glamour with a rock and roll flavor — the May Fair is the place to see and be seen. You need to have high tea at the Langham Hotel Shanghai. We were lucky to have a decadent delight in the 2 story chairman suite. The Langham Hotel brings the ultimate in luxury to the far east. 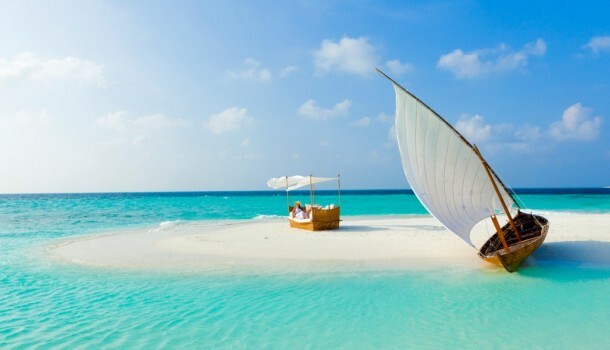 The Baros Resort is the 3rd resort ever built in the Maldives so naturally it has the best location! Stay in a tiki hut above the crystal clear turquoise water and watch the fish swim from your villa. Sail one of their traditional boats to your own private white-sand island and take a nap on your day bed… Actually this is the type of place where you don’t want to sleep. You want to absorb the magical energy of the Indian Ocean and let your body become one with nature. Heal yourself naturally at Como Shambala at this spa retreat with Ayurvedic doctors. 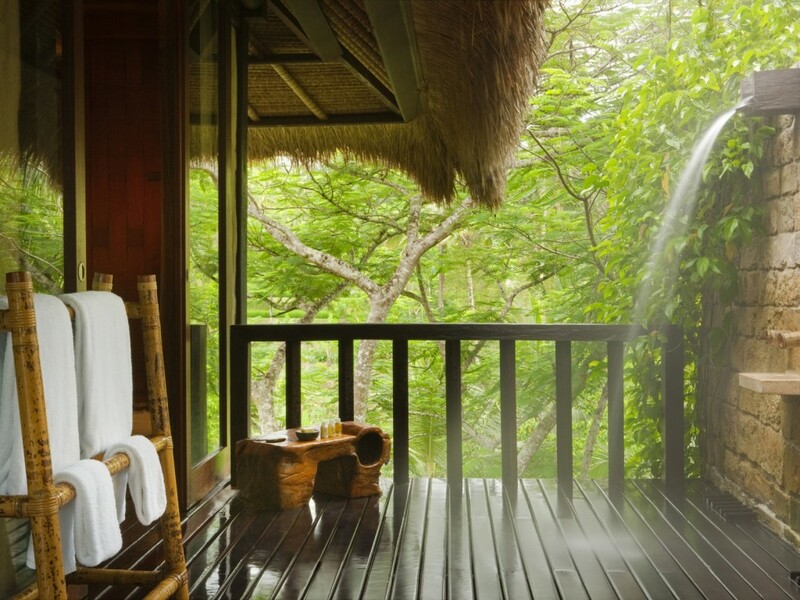 Relax and unwind in tropical paradise and take an outdoor shower in the middle of tropical paradise. This is the place to visit because doctors will assess your body type and devise a plan for you to eat the foods that are optimal for your health. Peace, zen and energy are prevalent in the air. Stay in a 1000 year old ancient Chinese village surrounded by 7 holy temples! As one of the most peaceful and tranquil places in the world, Amanfayun is located in the mountains close to the famous Westlake. Practice Tai Chi with the monks and feast on the best vegetarian cuisine in the world. The vegetables will blow your mind! Amanfayun also has one of the best tea selections! The Parker Hotel is an artsy oasis resort in the middle of the hot desert. Previously the Givenchy Hotel, the resort has been a destination for celebrities and trendsetters alike. The hip offbeat interior is filled with modern and retro items including knight’s armor, antique vases and classic crystal. On those hot desert days, guests will sip cocktails by the pool or in their private villas. The food is great too! The Southern Ocean Lodge is located on an eco-reserve perched on top of a cliff with an ocean view. The crisp clean ocean breeze has been home to Kangaroos and Koalas for centuries and now its your chance to actually live with them! With all the modern conveniences and contemporary design, basque in nature at its finest. Lofty style and pristine views make the Southern Ocean Lodge the place to go! There are only 2 Ritz Carlton Reserves in the world…Puerto Rico and Thailand! This 1200 acre property was once owned by the famed Rockefeller family. Today is an incredible lush resort! No wonder why Jay Z, Beyonce and Mariah Carey have been spotted here. As part of the Conde Nast Hot List, the spa is to die for. Get a hot stone and bamboo massage and you will feel like you have been transported to heaven. Don’t forget to dine at Mi Casa by Jose Andres. You can even have a private bartender session there for some creative mixologist recipes. Located in the Sulu Sea in the Phillipines, Amanpulo is the place to get away from it all. Walk almost a mile out in crystal clear waters the glisten with the sun. Relax in your villa and order a fresh fish which they will go out and get for you personally! It doesn’t get fresher than that! This is definitely the place to go and visit. As you arrive to Tahiti, you will see the resort from the plane. But getting there is another story! 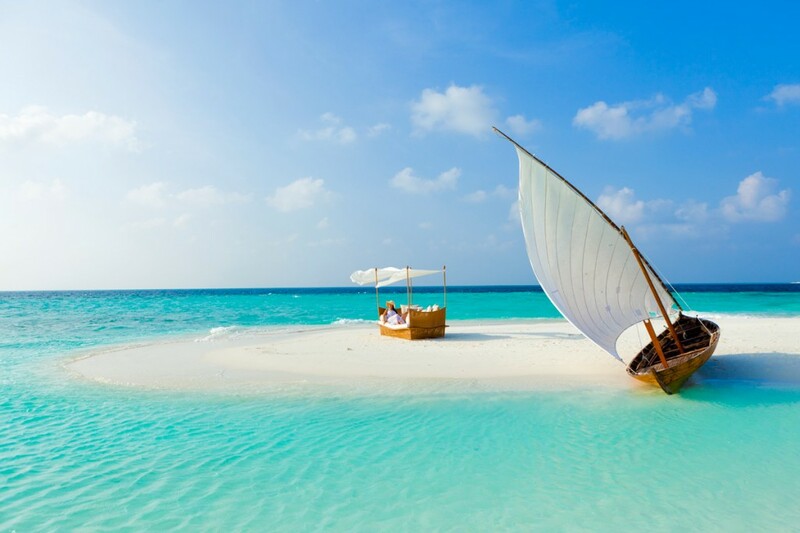 After you arrive by plane, take a private boat to paradise! Swim in the super shallow waters, get a massage and do absolutely nothing but admire the beauty of nature! Take polynesian cooking lessons, go on a dive site and see the most colorful fish in the world or take a lagoon safari…the possibilities are endless! David Copperfield bought Musha Cay back in the 90s and developed his own private resort. It is most famous for its private sandbar which is a 2 kilometer stretch that forms for only 2 kilometers a day. Imagine running on this strip or have a drink with luxury service and your own chairs and umbrellas! Musha Cay definitely tops our list of places to go. Find out more in Destination Luxury!